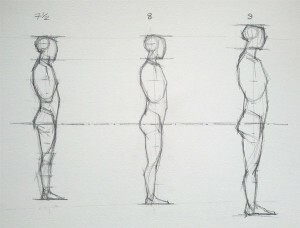 Good proportions are critical to a convincing drawing but what precisely makes ‘good proportions’? There are various canons of proportion; The figure 7 1/2 heads high, as discussed in Richer’s Artistic Anatomy, is perhaps the most widely accepted modern canon. There is the heroic 8 or even 9 head figure used historically in heroic sculpture, or in fashion and cartoon illustration. Historically one function of the use of different canons of proportions, even within one painting, was to distinguish between gods and mortals. The idea of a canon of perfect, ideal proportions is very platonic. In adhering to fixed proportions we are choosing to represent man or woman, rather than a specific individual. So the first point must be that proportion, whichever canon you choose to adopt is not a fixed standard but a series of variable relationships. Wider anthropological studies have shown how these relationships vary from one person to the next, within and across different groupings of people. Beside the obvious changes in gender, height or body type from one person to the next, even the skeleton is subject to variations! It is surprisingly common to meet people who have an extra cervical vertebra or one rib more or less than the average; and it is always interesting to enquire how these things came to be discovered. The purpose of learning a fixed canon is to enable us to evaluate these variations so as to describe an individual, rather than a generic average or someone’s ideal of humanity. This close study of variations is a caricaturists primary tool. Systems of proportion tend to relate well only to figures in reference positions. I rarely draw people in those poses but it is very helpful to have a sense of proportion to be able to evaluate the effects of perspective and foreshortening that will allow you to describe more unusal poses convincingly. After considering different canons of proportion, the wide range anthropological variations and the effects of perspective and foreshortening, what’s really left for us to draw on? In spite of all these vagaries proportion is still an incredibly useful concept. Our brains are wired for visual processing, so in the real world we are very good at shape and pattern recognition, such that we could recognise that a man is tall, even if he is stood alone, or notice his height if he were seated.